Fortunately, Nana is strong and stubborn and survived both surgery and weeks of rehabilitation. Nevertheless, the medical crisis took its toll on her strength and stamina. A long recovery meant new questions. How long would she need assistance? How long could she remain in her home alone? What if there was a second emergency? In a matter of weeks, we were considering options we had never fathomed, let alone discussed. But decisions had to be made. Ultimately that meant moving our family of six, including four children (now aged 7 to 15), and sharing a multi-generational home. We’re called the sandwich generation. It’s when adults are responsible for raising their own children while caring for aging parents. That care can be financial, physical, or emotional. In many cases, it is a combination of all three. The Pew Research Center reports that just over one out of every eight adults in the United States, between 40 and 60, is both raising a child and caring for a parent. In addition, another 7 to 10 million adults are caring for an elderly loved one from a long distance. As the boomer generation ages, the sandwich generation is also likely to expand. According to the U.S. Census Bureau, the 65-plus set will grow significantly over the next two decades. Here in Virginia, nearly one in every five adults is projected to be over the age of 65 by the year 2030. The decision to share a home with Nana was not a difficult one. It made the most sense for our family and in some ways, it was how I was raised. My own parents took in my grandfather shortly after he lost his wife. Suffering from Alzheimer’s and congestive heart failure, he was lonely and not in a position to care for himself. Although my parents were still supporting my college-aged brother, my grandfather lived with them for the remainder of his life. You could say they were early pioneers of the sandwich generation. The responsibilities associated with caring for children and seniors, no matter how large or small, can be overwhelming. In addition, no two sets of experiences are alike. So while I don’t believe there is an expert set of guidelines that will fit all families, here are suggestions that may help others facing similar situations. Learn the medical jargon. Often, the journey into caregiving begins with a medical emergency, as it did for us. In order to fully understand the situation, do your homework and come with a prepared list of questions. You will save the doctor time and get better answers. According to MSNBC.com, the U.S. is already 14,000 short of the number of geriatricians needed for the current senior population. With that shortage projected to increase, it may be critical to foster a relationship with your parent’s doctor. Know their medical history and keep a current list of all physicians, contact information, and medications. Get financially savvy. Collect your senior relative’s real estate, loan, and debt information. Keep copies of living wills, power of attorney, and life insurance for your loved ones. Consider whether long-term care insurance will work for your extended family. Don’t hesitate, if necessary, to consult a financial professional to navigate the long-term costs. Weigh the housing options. When it came time to consider sharing a home, we were lucky enough to have a large house to move to and the ability to renovate, thus accommodating everyone’s needs. However, this is often not the case or even appropriate in every situation. Before deciding which housing option is best, you should consider the long-term financial costs, the degree of medical care required, and what best fits their personality and your family’s needs. Retirement communities tend to be the most expensive option but offer dining and an array of social activities. Some even offer progressive assisted living with medical care, but ask questions. Many assisted living facilities have admissions criteria in place that require seniors to be in relatively sound health. When evaluating facilities, check out the Virginia Long-Term Ombudsman for statistics, complaints, and compliments. Arranging for in-home care at a parent’s residence may be less expensive but can still be financially draining. If you hire a caregiver, be sure to collect solid references and ask for a background check. Also, it’s okay to drop in unannounced and see how things are going. Finally, it’s important to consider what type of residence best fits the personality of your parent. In a recent study, The Pew Research Center reported that older adults who live alone spend less time on hobbies and are less likely to do volunteer work, get involved in the community, or spend time with their grandchildren. Consider an adult daycare center to keep them active. For seniors with limited mobility, investigate laundry, grocery, and transportation solutions. One growing trend is for seniors to cohabitate, thus saving money and gaining companionship. Finally, if possible, plan ahead with your parents, before a medical emergency forces the family into making quick decisions. Share the load. If there are siblings, be sure major decisions are as inclusive as possible. We are fortunate to have a large and supportive extended family. Don’t be afraid to ask for help. Designate a point person and divide responsibilities. Understand, however, that while it would be ideal for those responsibilities to be divided evenly, it’s not realistic. If you engage a caregiver or live-in help, everyone should work as a team. 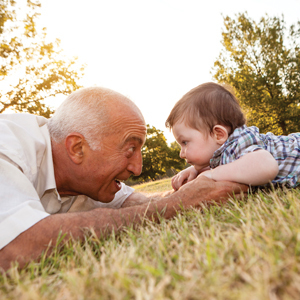 Encourage the bond between grandparent and grandchild. Maybe a grandparent can no longer play on the floor or even attend sporting events, but that doesn’t mean a special relationship can’t grow. In our family, my youngest just adores her Nana and their time together is a gift. Maybe mealtime, story time, or just looking at pictures together can be a way to create lasting memories. If your parent is long distance, keep reading. Use modern technology. Even seniors who have previously resisted using a computer can get connected with tablet technology that features large type and touch screens. Grandparents will be able to view pictures in an instant, send messages, or just play Scrabble again. My mother-in-law, who had never touched a computer before the age of 82, is now a devoted fan of her eldest granddaughter’s blog. Skype, the software that lets you video chat over the Internet, is also a great tool. Finally, check out the cell phones for seniors (some with built-in locators). It’s okay to be frustrated. Yes, it’s overwhelming at times and watching an aging parent suffer is difficult. Out of love, we often want our parents to try harder, fight harder, or do more. Give them a break and give yourself a break, too. You can seek help from your church, a social worker, or any local area support group. It’s been more than four years since my husband and I joined the ranks of the sandwich generation and began sharing a multi-generational home. Fortunately, my mother-in-law is still mostly independent, although she struggles daily with physical and chronic issues. Of course, sharing a home does require making a few adjustments. Honestly though, it’s probably been harder for Nana to share a home with us (why are those kids running and why are they so loud?) than it is for us to share with her. Either way, life goes on and we wouldn’t have it any other way. Kellie Murphy is a freelance writer who lives in Richmond with her husband and their four kids. She writes about safety, education, family life, and more.